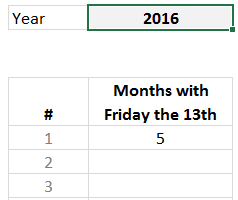 Here is a formula to find the first Friday the 13th in a year. DATE($C$3,ROW($A$1:$A$12),13) portion: This generates an array of 12 dates, one for each 13th of the month in the year C3. WEEKDAY(DATE(…))=6 portion: This checks how many of those dates are Fridays. Returns an array of TRUE / FALSE values. IF(WEEKDAY(DATE(…))=6,ROW($A$1:$A$12)) portion: This returns an array of month numbers where we have Friday the 13th and FALSE values. SMALL(IF(…),1) portion: This will give us the first month (ie 1st smallest value) with Friday the 13th in the year C3. IFERROR() to suppress any errors. To show all the Friday the 13ths in a year, simply replace 1 with an array of numbers (up to 3 should do). Click here to download Friday the 13th finder workbook. Enter a year in cell C3 and see all the months with Friday the 13th instantly. If you are still reading, I have a challenge for you. Can you write a formula to find the next year with three Friday the 13ths? Assume the year is in C3. Post your formulas / VBA in the comment section. hint: in the downloadable workbook, you can find an answer for this. So that’s all for now. Enjoy your Friday the 13th. This will generate a table of counts of Friday the 13th's by year. If I didn't screw it up the next year with three is 2026. I created a simple parameter table with a start date and end date that I wanted to evaluate. That calculates the number of days and generates a list of those days. Then filter and group. The generation of the list in power query (i.e. without populating a date table in excel) is pretty cool, otherwise this isn't really doing anything than creating a big date and filtering/counting. With the parameters replaced by values should you want to play along at home. This runs for 20 years starting on 1/1/2016. It should be pointed out that Alex's solution, unlike some others, has the additional advantage of being non-array. My solution was nearly identical but with -- and SIGN instead of N and 1^. I've a doubt with using array formula here. In sample workbook, I tried to replicate the formula again. and since it is array formula I can't edit individual cell. Cool stuff. You need to clarify that the answer of 5 represents the 1st month in the year that has a Friday the 13th, and not the number of Fridays the 13th in the year. Subtle, but important difference. I like the MMULT() function far more, but here's how I would have tackled it. It uses an EDATE() base and MODE() over 100 years. I'm assuming that 100 years is enough time to catch the next year with 3 friday 13th's. Array entered, of course.